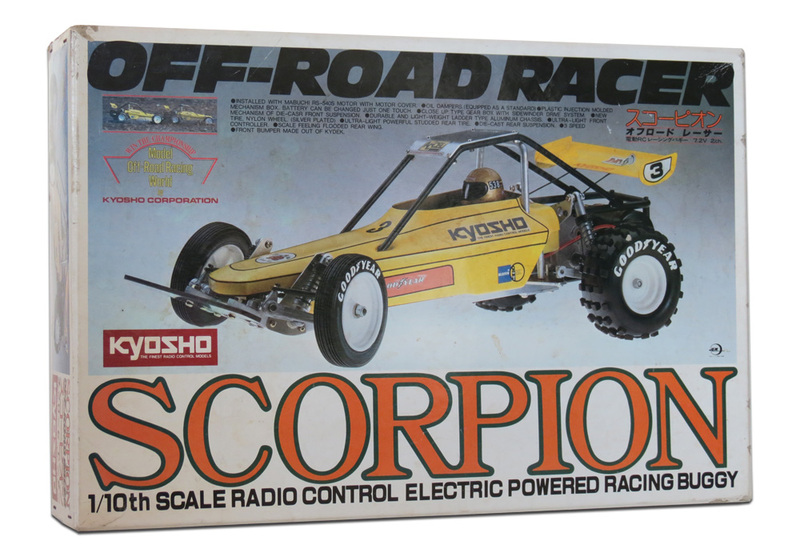 The original Kyosho Scorpion was both a beautiful kit-based off-road 2WD R/C buggy based on a real-life vehicle, and a milestone in R/C racing. 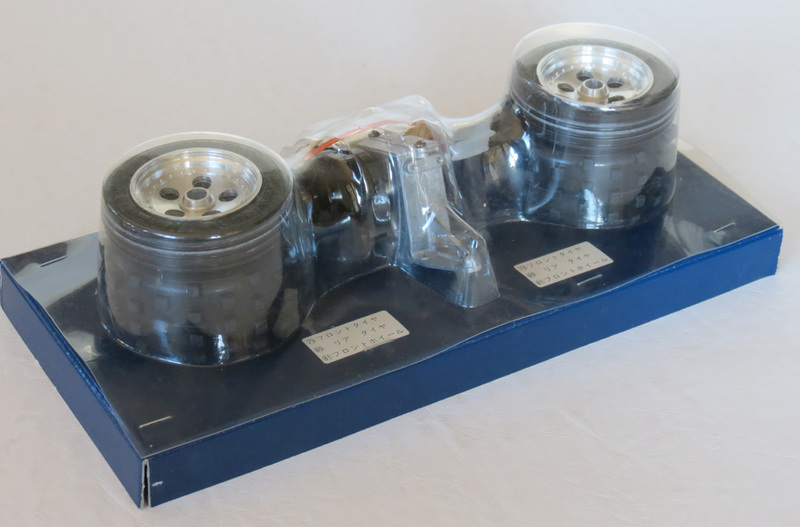 Today, it’s a highly collectible and historically significant vintage R/C kit. The year 1982 sure feels like a long time ago now. Although when I think about it in terms of famous movies, it was the year that a number of all-time classics were released – films that have stood the test of time such as The Thing, E.T. the Extra-Terrestrial, The Dark Crystal and Blade Runner. I still watch these films every couple of years, and they always transport me back to that era. Cool movies and cool toys – 1982 pretty much had it all! Early Vintage – Notable for yellow chassis tub, “Goodyear” embossed on tyres, the front tyres having a tread pattern consisting of 7 small ribs, solid silver chrome wheels, and silver shock absorbers. Mid Vintage – Difference: Same as Early Vintage, except the silver chrome wheels have 5 holes and the shock absorbers are now anodized in red. May also have “Sand Super” written on all tyres, and the front tyres have a tread pattern consisting of 4 larger ribs. Late Vintage – Difference: Same as Mid Vintage, except for a black chassis tub. Other notes – Certain elements of the car depicted on the box photo were never actually released into production – such as the solid white wheels. Kyosho Scorpion (2014 Remake). Modern remake with new model number. Made in Taiwan (not Japan) from different molds, with many changed parts. But if you think about it, there’s also one actual similarity between retro toys and movies – practicality and realism. Sci-fi films in 1982 were created with practical special effects – spacecraft, creatures and other fantastic images were all created using real objects, puppets and models. There was almost no CGI in those days. Everything in 80s movies had a utilitarian practicality about it, because it was built, carved and animated out of real objects. And this meant things looked and moved realistically in movies. Meanwhile, in the completely unrelated world of radio controlled model cars, there was also a utilitarian practicality about that era. R/C cars looked and moved quite realistically too. Mainly because they were based on real vehicles, and toy manufacturers felt they would not sell unless they closely resembled the real thing. The end result is that I look back on that early 80s era with a sense that many of the things that entertained us in those days, were more interesting for their practicality and realism. You might even draw a similar parallel today – in 2014, the boring lexan blobs that pass for a lot of the lazy R/C car model designs that we see these days, offer a parallel to the hyperactive and overblown CGI crap-fests that pass for a lot of films. Many modern R/C cars are often way too fast to seem realistic and barely even look like “cars” anymore. While modern Sci-Fi films are often way too fast and filled with unrealistic CGI creatures and robots that move too rapidly for their size. Luckily, it’s not all bad. Occasionally we still get films like Moon in which practical miniature models are used, or even Wall-E in which CGI is used (in a good way) to depict a realistic and practical robot. And of course, there’s nothing to stop us continuing to enjoy the classics of the past either. And that’s where the Kyosho Scorpion comes in. 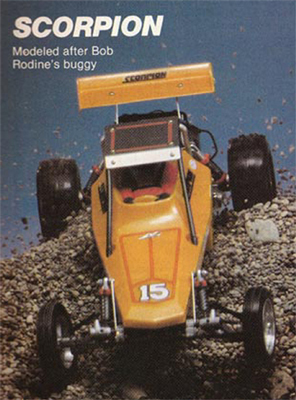 In 1982, the hobby of buying and building 1/10 scale R/C kits, particularly off-road buggies, was still quite new. And many of the models being released at that time were taking their design inspiration from real, full-sized buggies and other vehicles that were being raced in the USA. 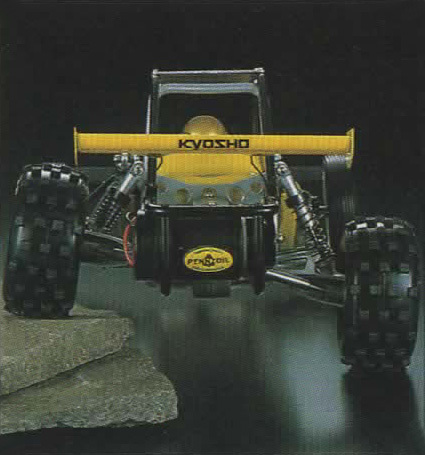 In Japan, R/C model manufacturer Kyosho had already released a number of off-road vehicles prior to 1982. But the majority of these had either been gas-powered or featured quite basic chassis designs with little (or no) suspension. And by then, rival Japanese kit maker Tamiya had become the undisputed leader of the popular 1/10 scale electric buggy category. This category seemed to have hit the “sweet spot” with many consumers – the convenient size and clean-running characteristics of these electric models had made them popular among all ages. And this meant organized racing events were beginning to spring up all over the world as well. But while Tamiya had entered R/C from a background in plastic model kits, Kyosho’s background was already rooted in R/C models – with an emphasis on competition racing in Japan. So it made sense for Kyosho to want to release models that were as competitive, as they were attractive. 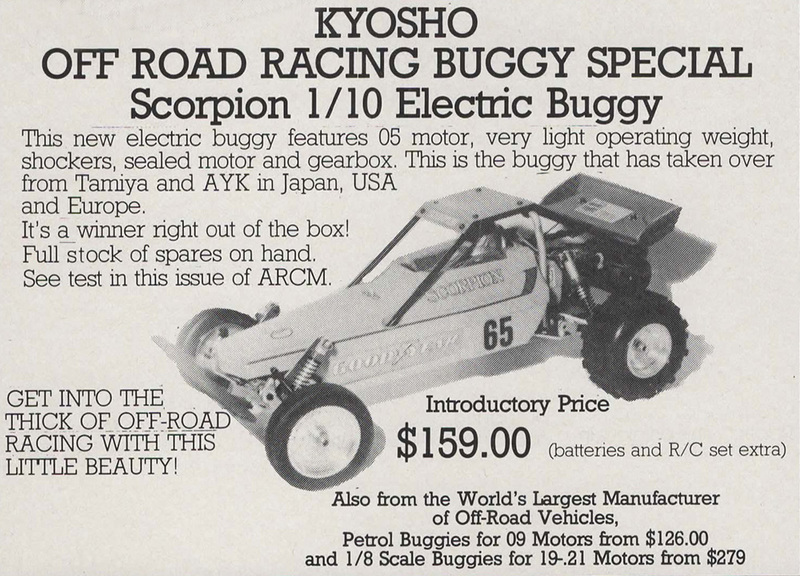 The history of the Scorpion really begins in 1981, when a young man named Akira Kogawa landed a job with a company called Auto Model Co., which was a design house with ties to Kyosho. Akira was just 19 at the time, but already a keen racer of 1/8 scale models, and within a year he was offered the chance to lead the design of electric R/C models for Kyosho. His first creation in 1982 was an innovative snow-mobile called “The Blizzard”, and he soon followed this with the “Scorpion”. He later designed several other famous buggies for Kyosho, including the Optima. And in the 1990s he went to work for HPI, designing models like the Baja 5B (which, amazingly, still slightly echoes the Scorpion design). Over 30 years later, Kyosho celebrated the 50th anniversary of their company with an interesting colour history booklet. In it, Akira Kogawa was actually interviewed and photographed with some of his early creations, and he described the Scorpion’s body as being “a Kogawa original”. 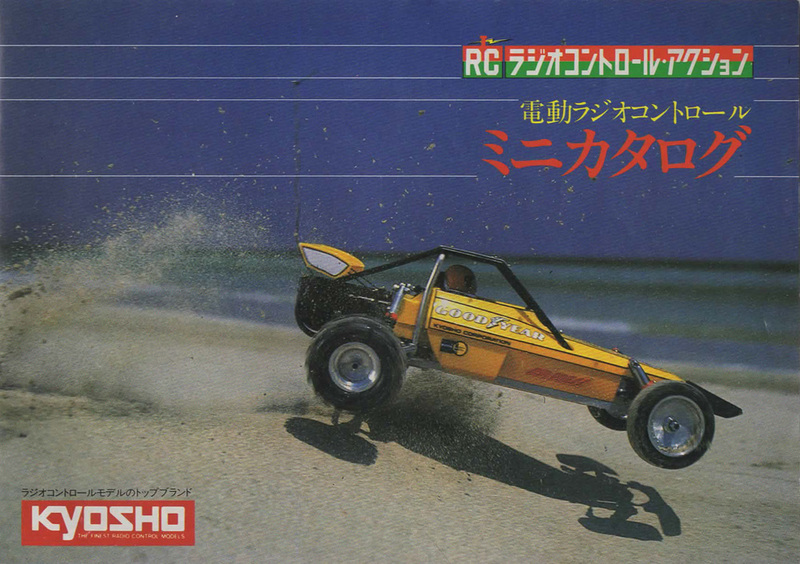 Based on the photos you can see on this page, it’s pretty clear that the design was not so much a Kogawa original, as it was an original R/C car design heavily inspired by a real vehicle. So what made the Scorpion significant? 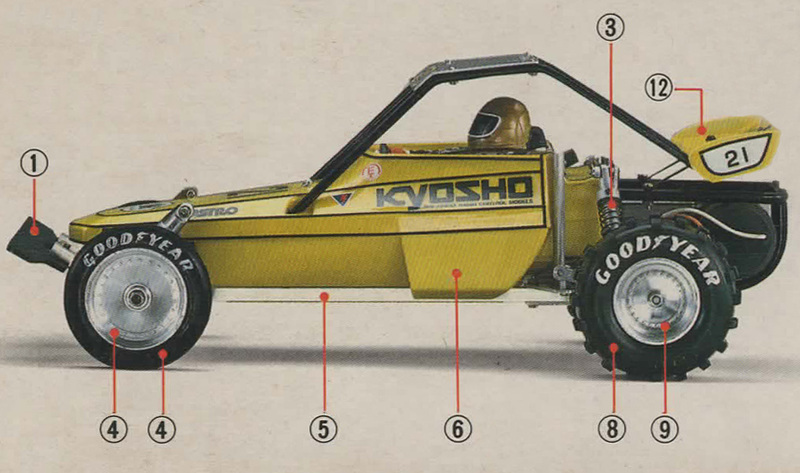 The Kyosho Scorpion represents a high point in the effort to release models that both looked real, and offered advances in performance. The best performing alternative 2WD kit buggies that you could buy in those days, were the Rough Rider, Sand Scorcher and Super Champ from Tamiya, the Super Trail from AYK, and the Digger from Bolink. While all are now beautiful pieces of history to collect, the Scorpion’s weight-saving chassis and long-travel suspension arms with four-wheel independent suspension – mean it is remembered for being virtually unbeatable in competition racing in it’s day. 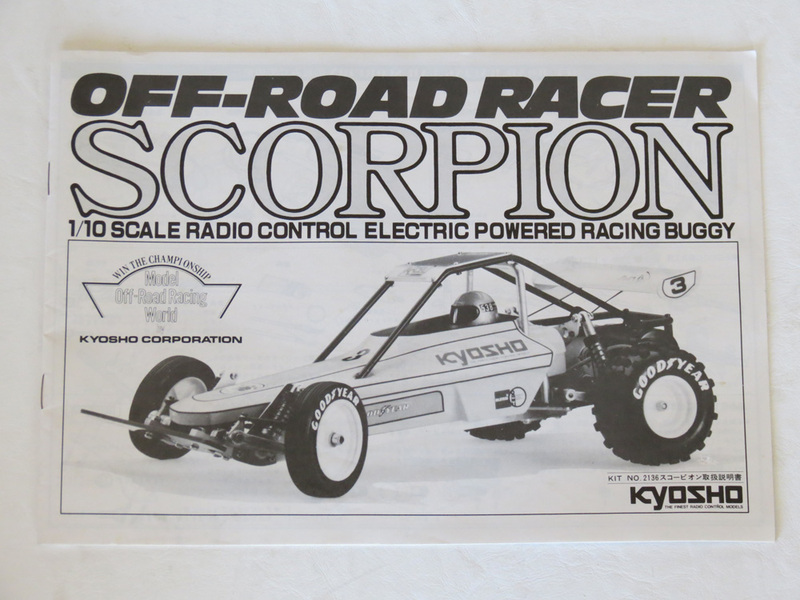 In fact, even as late as 1985, Kyosho Scorpions were still chalking up the occasional win in competition. 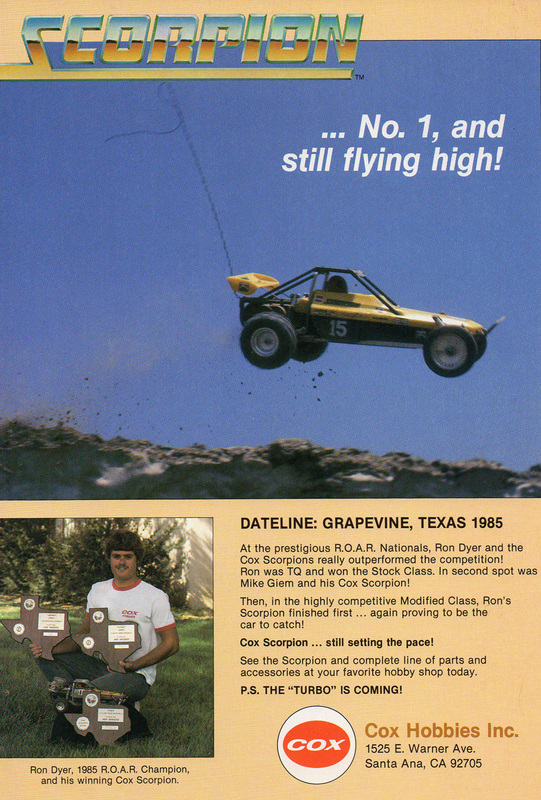 According to the advertisement below, Scorpions won both the stock and modified classes of the 1985 ROAR (Remotely Operated Auto Racers) Nationals event in the USA. From 1984 the most formidable 2WD vehicle for racing was the Team Associated RC10, and this was really the vehicle to beat. 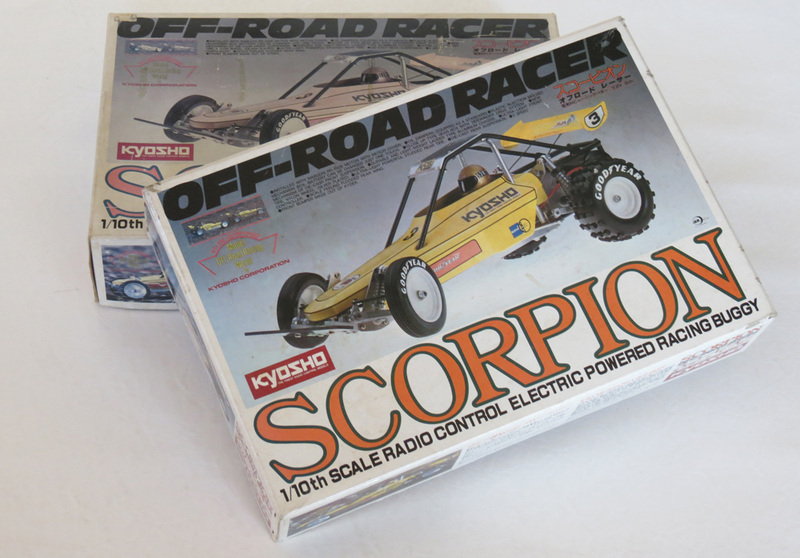 While in 1983 the Tamiya Frog began to offer the Scorpion some competition too, taking out some national titles such as the 1984 German Nationals (which the Scorpion had won in 1983). Away from the world of competition though (as most people were – including myself! 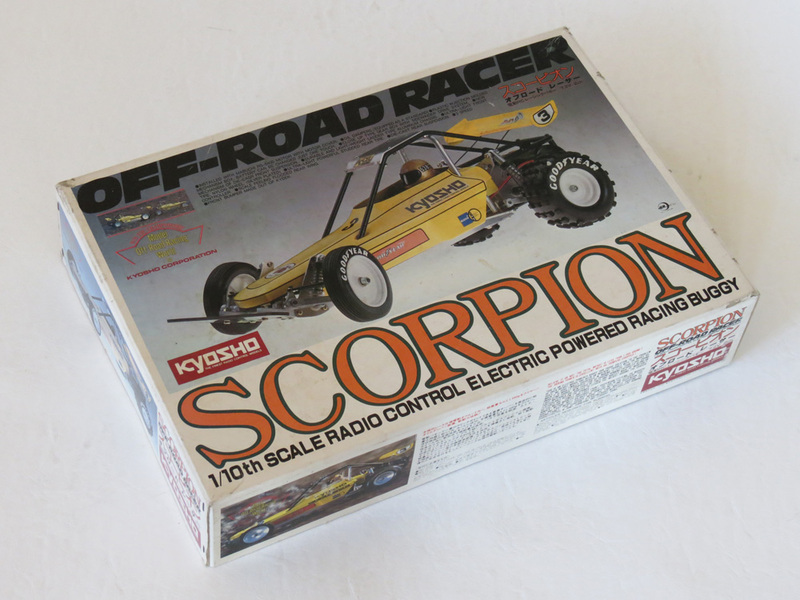 ), an R/C kit like the Kyosho Scorpion represented a dream for the average kid with no money. Most kids probably didn’t even know this buggy existed as it was only sold at hobby stores. Obviously if you were a kid with no money, a high performance R/C buggy like this was only going to fall into your possession if your parents were willing to fork out hundreds of dollars on the kit, radio, battery and other necessary accessories. Which is not really something my parents would have been able to do back in those days. Despite this, over in the USA where the car was branded as the “Cox Scorpion”, it actually came pre-built in a box covered in illustrations of people driving Scorpions – which suggests a conscious effort was being made to ensure the car appealed to all buyers – not just competition racers. This was, after all, a much more innocent age of R/C models – even at the hobby grade end of things. Competition racing may have existed, but it was not as serious as today. And at all levels, R/C toys were designed to be appealing to children and adults alike. While the Scorpion may have been available in ready-to-run form in the USA, and while I’m a great fan of ready-to-run R/C toys from all brands (not just hobby brands), when it comes to those models that were originally sold as kits – then the kit is usually the thing I prefer. Kit versions were usually the original release, and came in big, bright boxes featuring great images. 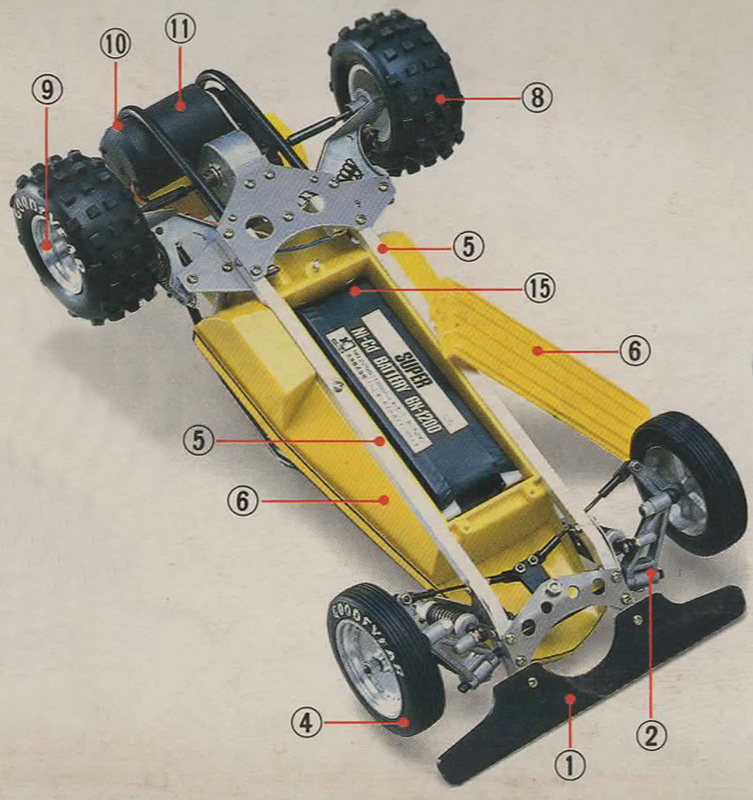 Plus a kit offered you the fun of building the car yourself, cracking open all those brand new parts and seeing it come together in your own hands. Another great joy of many vintage kit R/C cars of course, is the nice blister display of parts inside, and the Kyosho Scorpion actually represents one of the earliest Kyosho models to feature this type of display – perhaps taking a cue from Tamiya who had made the practice standard in all their R/C kits. Tamiya of course were the masters of marketing and were releasing beautiful models every year. 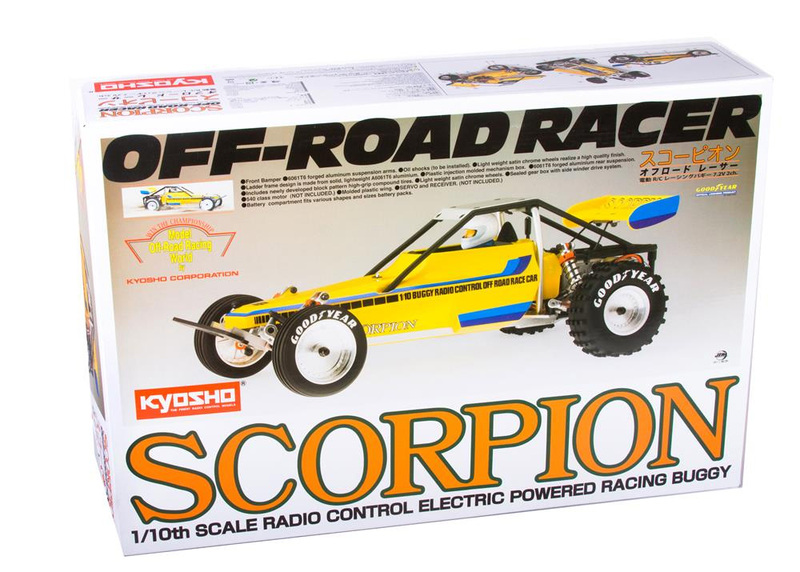 The Kyosho Scorpion kit suggests Kyosho were willing to emulate Tamiya somewhat to gain some market share – fancy packaging, and a colourful, eye-catching and attractive buggy design. However, the influences didn’t all flow in one direction. Tamiya’s most popular buggies of all time were the “animal themed” ones – you know, such as the Grasshopper, Frog, Hornet, Fox etc. But let’s consider that the first of those was released in 1983. So it seems the idea of naming R/C buggies after animals originated elsewhere. Perhaps the one of Tamiya’s most famous, “The Hornet”, was a response to Kyosho’s “Scorpion” too? After all, both animals have a sting in their tail. 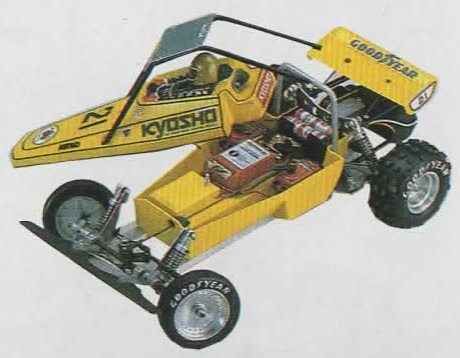 Personally, my favourite aspects of the Kyosho Scorpion’s design are it’s bright yellow colour theme, realistic frame buggy appearance, and cool “Goodyear” tyres (found on earlier variants). It should be noted too that in the early 1980s, it was apparently easier for toy and hobby companies to license real world brands, and that this became less viable as the years rolled by. 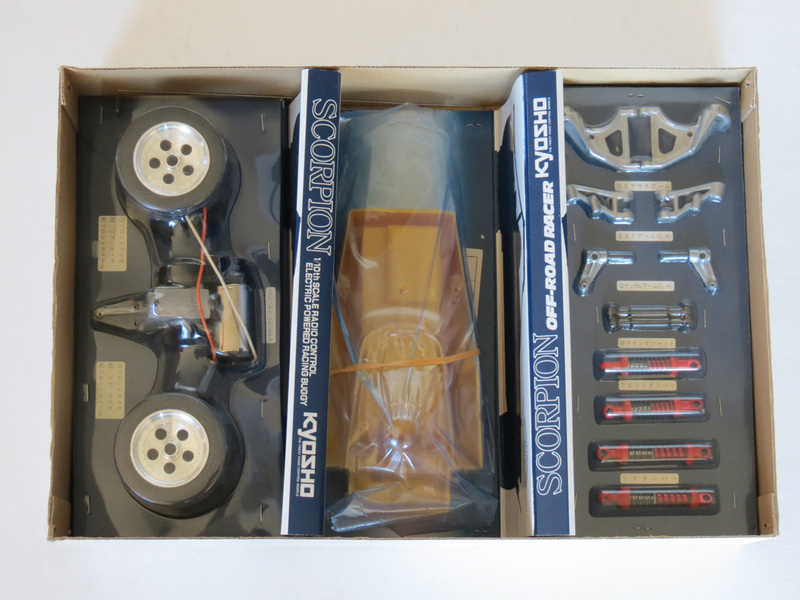 Collectors of the Kyosho Scorpion will therefore be aware that the early Scorpion kits came with those lovely “Goodyear” tyres as shown on the box, but later the tyre lettering was changed to read “Sand Super” – apparently in response to a difficulty related to licensing. Naturally, those Goodyear tyres are the more sought after (and the most rare). Though any new sets of original tyres for this car are now highly prized. Inside the box, quite a few of the parts are made from cast aluminium, as seen here. I mentioned earlier that the car had an unusually light-weight design for it’s time. Unlike most R/C kit models of that era, the Scorpion’s main chassis consists of simple aluminium rails connecting the front suspension to the rear gearbox. 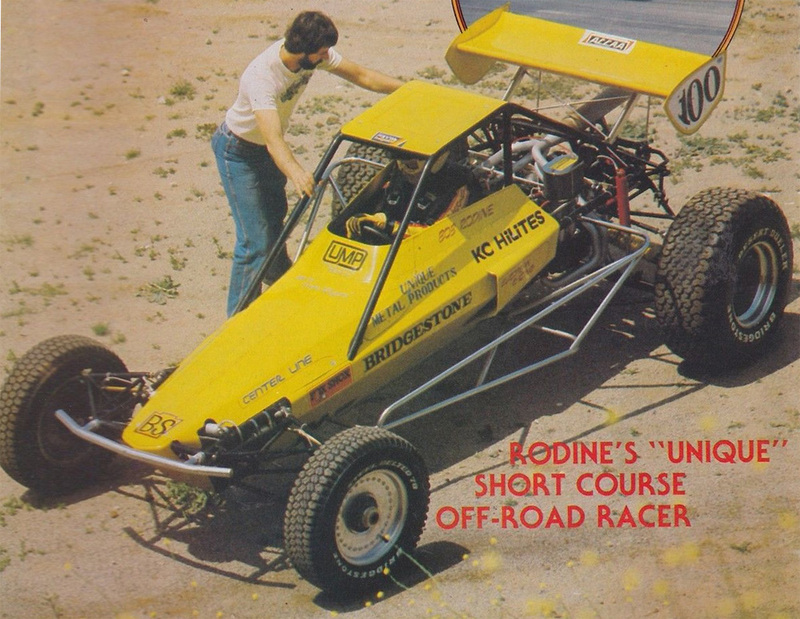 Sitting on top of this is a bright yellow tub (changed to black in some later examples) to hold all the radio gear, plus a lightweight lexan body shell that was not only a lighter body type than most other R/C buggies used at that time, but it also acts as the lid for the radio tub – saving further weight. All of this cast aluminium may seem quite heavy by the standards of modern R/C buggy kits, however it was actually very lightweight for it’s time and offered a weight saving of several hundred grams (20-25%) over the other top-level buggies. I guess a lot of that saving comes from the use of the lexan body, and the spacious design of the rail-chassis – but there are other little savings too in things like the one-piece chrome plated wheels, which were simpler and lighter than the 3-piece screwed-together wheels used by the Tamiyas of the day. Inside the radio tub is the typical 1980s vintage equipment setup – 2 servos, with one moving the wiper arm of a mechanical speed control. Plus the receiver. And of course, the 4 x AA battery set that was used to power the receiver. The 7.2v battery pack would fit snugly beneath the car in a separate compartment, covered by a big battery door. Another great retro feature is the large rubber sock used to cover and protect the motor. I always love how 1980s kit buggies went to extra lengths to protect, cover, and waterproof various components. It shows a certain naivety of design (often these things were non-essential), but I now look back on it with great fondness because all those little things add enormous character to the toy. It’s what collectors call “over-engineering”. Speaking of character though, and while I mentioned earlier that the Scorpion represented an animal-themed R/C buggy long before Tamiya had used the idea to great effect, I have to say I think it was in name only in this instance. The Scorpion is a great looking car, that’s for sure, but I’m at a loss to see how it’s shape relates to the animal. Maybe it was just about “stinging the opposition” on the track. Nevertheless, I always find myself drawn to bright yellow cars, and in this case the combination of yellow body, yellow radio tub, and all those cool retro brand sponsors and fat tyres add up to quintessential 1980s R/C fun. It’s simple, it’s eye-catching, and it gives the car a well-proportioned and realistic scale appearance – what more could you want? In 2014, the Scorpion underwent a remake. 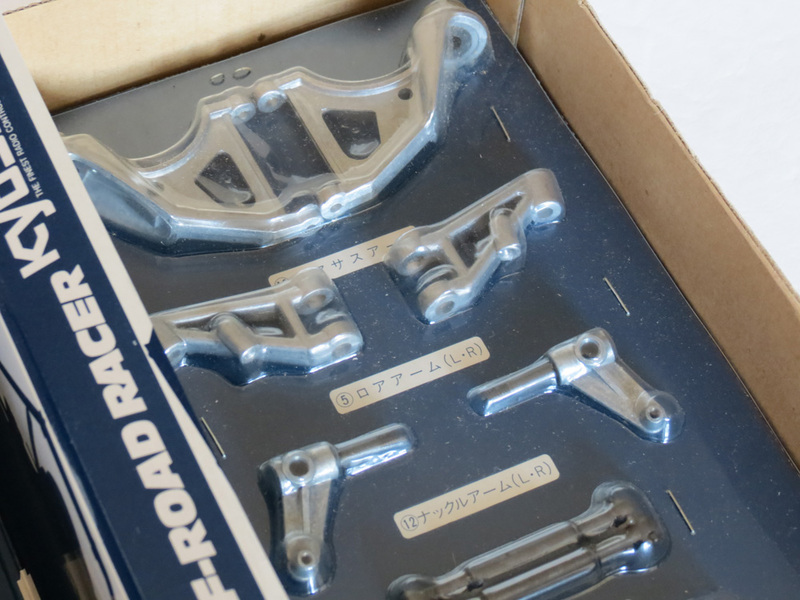 The 2014 remake is made from completely new molds because the original Kyosho molds were lost or destroyed many years ago. It is also made in Taiwan, China (instead of Japan like the original). In effect, it is a new model created from scratch to look like the original, without sharing any parts with it. As such, the remake Scorpion features many physical differences – such as different shocks, tyres, decals, wider overall dimensions, different driver, no mechanical speed control, different box art… to name just a few of the changes. 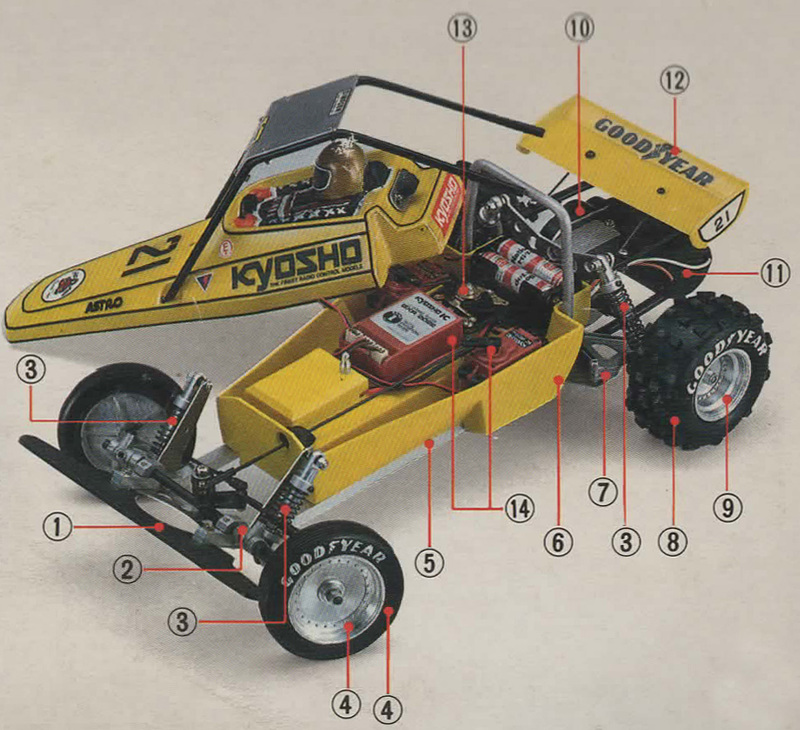 There’s no doubt though that this is one of the really classic top-level buggies of the 1980s, and one of the cornerstone pieces if you’re interested in vintage Kyosho models. When it comes to vintage R/C collecting and restoring, what could be more fun than tinkering with a high quality vintage R/C buggy that looks as great as this? Nice article about a true vintage classic, Rob. And it’s great to see movie makers as well as RC manufacturers realizing that stuff needs to look truly real and authentic for an audience to believe in it….hence the forthcoming Star Wars Episode VII movie being shot with real sets and props, just like the original trilogy was. I think you are being just a tad unfair to the re-release though, when you describe it as being significantly different physically and having merely a “retro look”. In reality the 2014 version looks pretty much identical to the untrained eye. In fact i would say that even seasoned RC enthusiasts will need to go hunting around the model to realize the differences. Thanks Andy, your opinion is always welcome! I think the 2014 Scorpion differs from the original by a greater factor than even most Tamiya rereleases considering it uses new molds, as well as all the intentional changes. Personally I noticed the different tyre tread and shocks as soon as I saw the first photos. I know you’re a fan of the only slightly-different original Tamiya Hotshot Mk1, and would go the extra mile to own one. I can count more reasons for collectors to go the extra mile to own an original Scorpion over the new version. Well to be fair I have never been an expert on the Scorpion and the fine details of it so I guess to someone like yourself who has an in depth knowledge of it the differences are easily spotted. I have two re-release kits and I still cannot really see the design changes though, LOL. – love it! 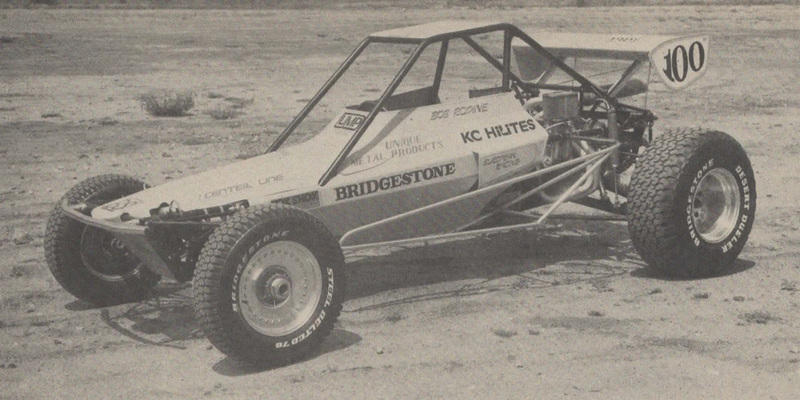 Great looking buggy. But the racer’s hair and mo are the best. Very interesting read on a great buggy in history. 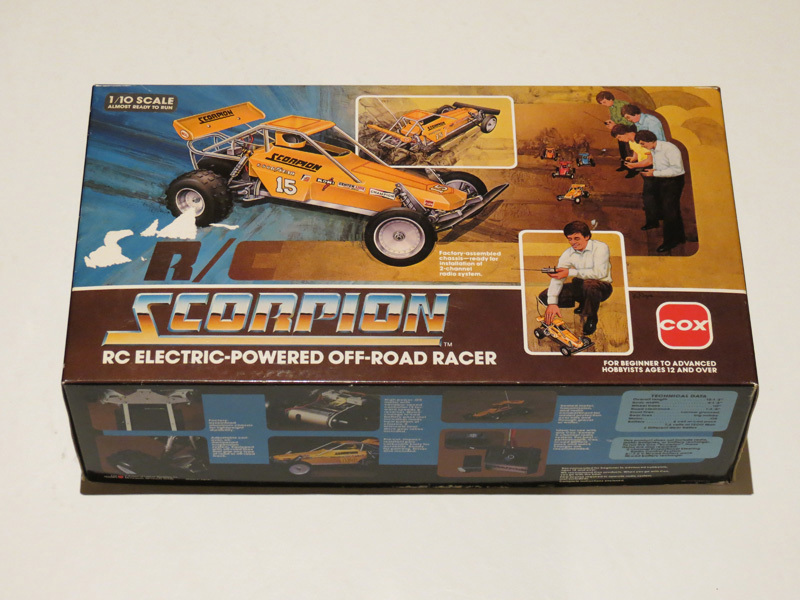 The Scorpion was my very first buggy as a 12 year old and I thought it was brilliant at the time. I’ve recently purchased a re re version and can say that it did exactly what I was after in taking me back to the time I first assembled the Scorpion back in 82. Any changes were insignificant to me and I probably prefer to own a re re than an original as it has the performance and strength of a more modern vehicle but still retains the all important scale looks, a few knob differences on the tyres and track width or bigger shocks doesn’t matter to me. I’d say most people would be quite happy to own one of these re re’s to either run or display. One thing I seem to remember about my original Scorpion is it came with three piece rims not one piece as was mentioned, maybe they changed the kits later in the production run. Do you also know why I’ve a set of white rims and a set of “chrome” rims (this one look pretty close to the re-realese rims, but I’m sure that mine are original ones). About the tires I’ve both versions, goodYear and SandSuper ones and the differnce is not just about the name on them; SandSuper ones have also a different tread. Rims: the original Scorpion came with either smooth silver wheels, or silver wheels with holes in them. The smooth white wheels depicted on the actual box photo are actually not wheels I have ever seen on any Scorpion other than the box photo. I have been told they existed, and I am happy to be proven wrong – but I am yet to see any evidence they were ever sold to the public. Are your white wheels smooth, or do they actually feature holes? Because the later Turbo Scorpion (an entirely different model) did also come with white wheels, but they always had either triangle or circular holes in them. Perhaps your wheels are actually some Turbo Scorpion ones. 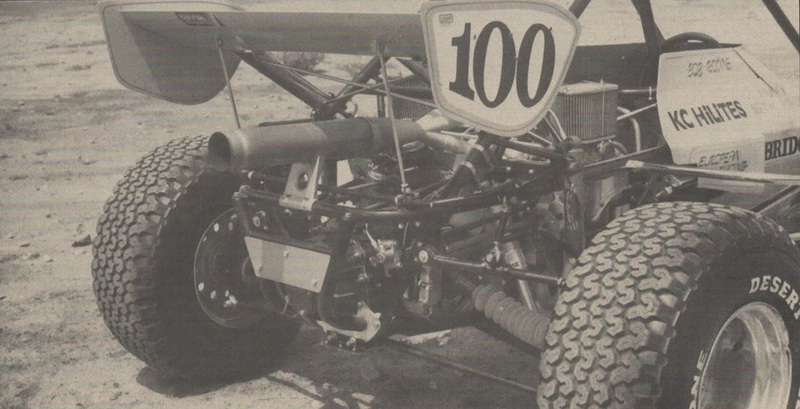 Rear Tyres: The original Scorpion came with either “Goodyear” or “Sand Super” on the rear tyres, and a block pattern of square knobs on the tyres – alternating between 3 and 4 knobs per row. These original tyres are IDENTICAL, except for the tyre lettering. There is no tread difference. The recent 2014 reissue Scorpion does also have rear tyres with “Goodyear” on them, however these tyres are 100% different to the original 1980s tyres – they are made from a new rubber compound, the tread is different (there are many more “knobs” on them), and even the sidewall writing is done differently – the writing on them is just sprayed on in white paint by Kyosho, and the letters are not “embossed” in the rubber, and in fact many reissue Scorpions arrived with the white writing already flaking off inside the kit box, due to Kyosho’s poor quality control from the Chinese factory where the reissue kit is made. So is it possible the rear tyres you have, are actually the reissue ones with the different tread aspect? Thanks for your research! It’s always great to hear from people with a keen interest in the original details 🙂 Please note that my Kyosho Scorpion page here is still under construction and the “mk1, mk2, mk3” breakdown may be adjusted as more little differences come to light over the years. thanks for your quick and exhaustive reply! Trying to make things more clear with you I may add this things; I’ve found all my scorpion parts about 4yrs ago, so quite before that the re-release come out, that’s why I’m confident that are all original. Rims: I think that you got it right once again because my white set have triangle holes, so they should belong to a Turbo Scorpion as you say so (this rims are those that comes with “SandSuper” tires with a different tread). My scorpion come to me in the German box version, so even if the box show white smooth rims, according with what you say, the chrome smooth rims with GoodYear tires that I’ve found in it are the original ones, isn’t it? Your English is actually very good 🙂 So no worries there. And yes your parts are definitely original if you got them 4 years ago, which is good. So yes, those white rims with the triangular holes are from the Turbo Scorpion. To be specific, the ones with the triangular holes are technically the Turbo Scorpion Mk2. Turbo Scorpion Mk1 had white rims with round holes (as seen on the Turbo Scorpion box). Both are original. The chrome smooth rims you have are definitely original too, yes. These rims are the earlier type, found on the Kyosho Scorpion Mk1. When it comes to overseas releases like the Graupner/Kyosho Scorpion, your example must also be an early example within that release, if it has those rims. …then they are the original Scorpion rear Goodyear tyres, and not the reissue. These tyres are highly sought after and super hard to find! You can read more about them here. just have a look to some Turbo Scorpion pictures on the web, and yes, my white set rims/tires looks identical…so maybe also the black chassis tub may belong to a Turbo Scorpion…? The black chassis tub is actually still original for the Scorpion, not the Turbo Scorpion (the Turbo Scorpion only came with a white chassis tub). But the black tub came in the very later examples of the Kyosho Scorpion – I have updated my details above, and at the moment I have the black tub as part of “Mk4”. But I do know it was also found commonly on the Cox/Kyosho Scorpion (USA) and the Graupner/Kyosho Scorpion (Europe) releases. I am not sure if either of these releases ever had the yellow tub. Exact Kyosho release sequence is very tricky to work out, and I should stress that all of this is a bit like the work of archaeologists, digging up dinosaur bones and trying work out the colour and personality of a dinosaur 🙂 The best we can do is to keep refining the information over time. Hello, I just stumbled on your site and I have to say it is absolutely awesome. I love all of the vintage ads, they make me very nostalgic. I’m wondering, would you mind if I used some of your ads in my photo gallery if I gave a credit and link back to your site? Thanks for posting this stuff.